(CNN) Potentially life-giving water still flows across the ancient surface of Mars from time to time, NASA scientists said Monday in revealing a potential breakthrough in both the search for life beyond Earth and human hopes to one day travel there. 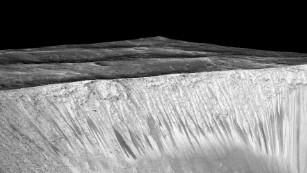 NASA says it found proof of water in dark streaks like these, called recurring slope lineae, on the walls of the Garni Crater on Mars. Next Post: Are You Eating Yoga Mats from Subway?